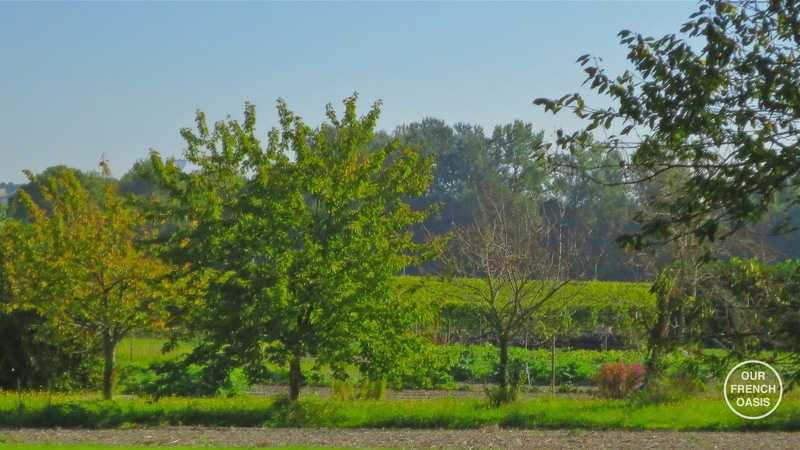 Living here in the Charente Maritime, we are but a couple of vineyards away from the world-famous Cognac region of France. Bottles of the golden nectar sit on most shops’ shelves in the region, and it seemed unbelievable to us recently that we had not yet been to a domaine and seen a little of the cognac world for ourselves as it does seem to be a popular topic of inquiry for many of our friends and relatives. Thinking this would make a wonderful addition to my series of interviews with local artisans, Roddy and I finally set off last week for an ancient vineyard close to us where we had an invitation to visit from a Charentaise family that has been producing France’s favourite spirit for over 11 generations; we were eager to learn as much as we could about a drink that everybody knows about, but perhaps has no real idea of. Cognac is only made in one part of France; this is in an area inland of us, centred around the town of Cognac, from which the drink takes its name. The region is divided into several smaller areas or “crus”, each of which is defined by the cognac it is authorised to produce, with each cru differing according to climate, terrain and terroir, all of which affect what grape is grown, and what it will end up producing. 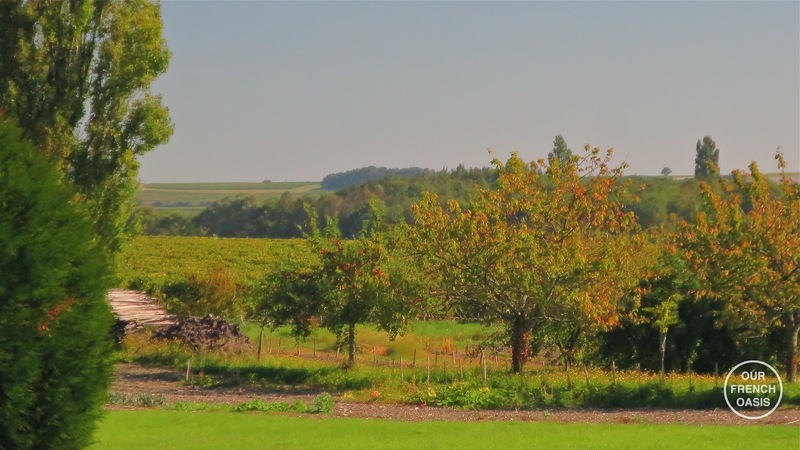 The domaine we were going to visit is in the western part of the region, in the Petite Champagne zone, an area of approximately 15,250 hectares where longer ageing eaux-de-vie (the base liquid for cognac) is produced. Much of this product is sold to the ‘grand’ houses for blending into the most well known brands. 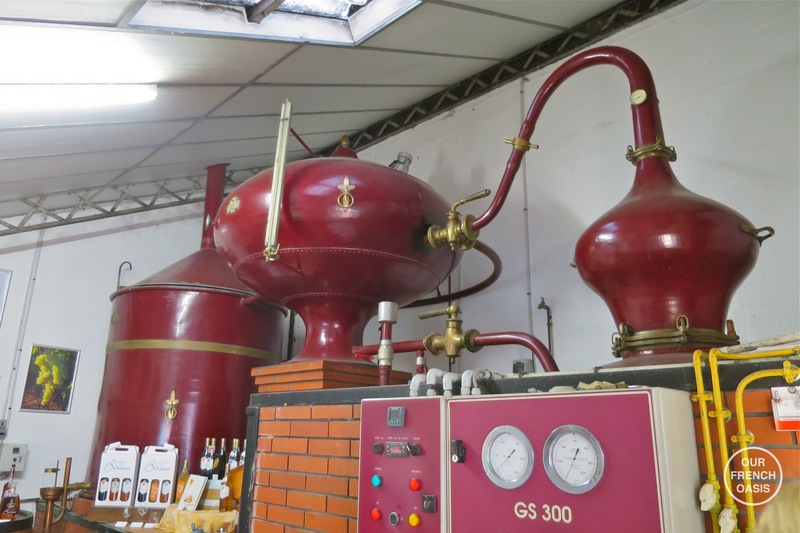 Our target for the day was the Domaine de Birius, which while traditionally a source of blending eaux-de-vies, has recently started to sell to the public some of the cognac they have always produced. This type of cognac is called a single-vineyard cognac, and is often made by blending a variety of different age eaux-de-vies; the taste of the final product can thus vary from year to year, according to harvest and the senses of the master-taster, or maître-de-chai. With this in mind we set off on an impossibly beautiful morning after dropping the children off at school, and 40 minutes later bumbled down a lane between serried ranks of gnarled vines, our destination a collection of buildings deep in a sun-dappled corner amongst the fields. Tall machines scurried to and fro on the slopes, and distant figures stooped and pointed. It seemed a little busy for a domaine that was not harvesting, but we were not duly concerned as we turned the corner amongst some low buildings and pulled to a stop by the accueil, or ‘welcome’ sign. Down the side of a huge chai, we could see a very pretty tall young lady awaiting us, and we knew we had met our hostess for the visit, Elodie, the daughter of the house. 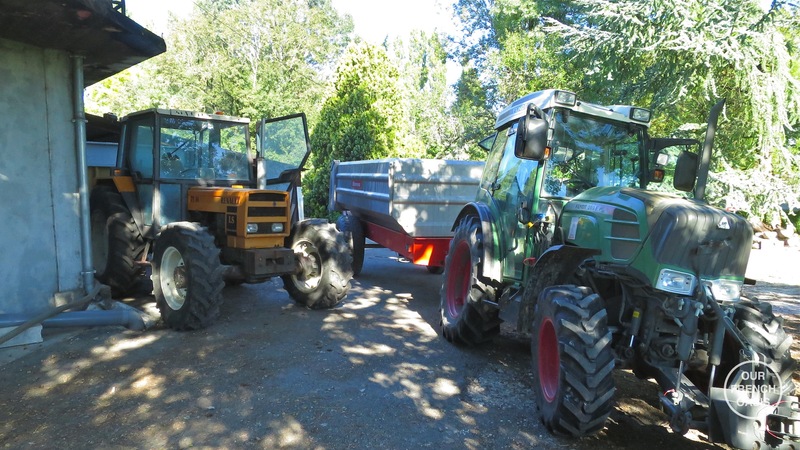 We closed the car doors and went down to say hello, only to discover to our consternation that things had changed due to weather and the day had been designated a harvest day after all, and we were in the midst of one of the busiest days of the year! We felt successively worse as the visit progressed and we came to realise that Elodie was an integral cog in the operation, not just a pretty face for visitors. How she managed to make time for us is still a wonder, but in between tapping a myriad of computer screens, shutting some valves, opening others, and overseeing the arrival of several tons of grapes for pressing, she still managed to give us a 5-star personal tour! We started in the end of the chai, the distillery room. This small sparse room was dominated by the traditional alambic, a traditionally shaped copper ‘still’, unique to the Charentais area and the cognac tradition. It was here that we learnt the basics of a millennia’s worth of distilling process. 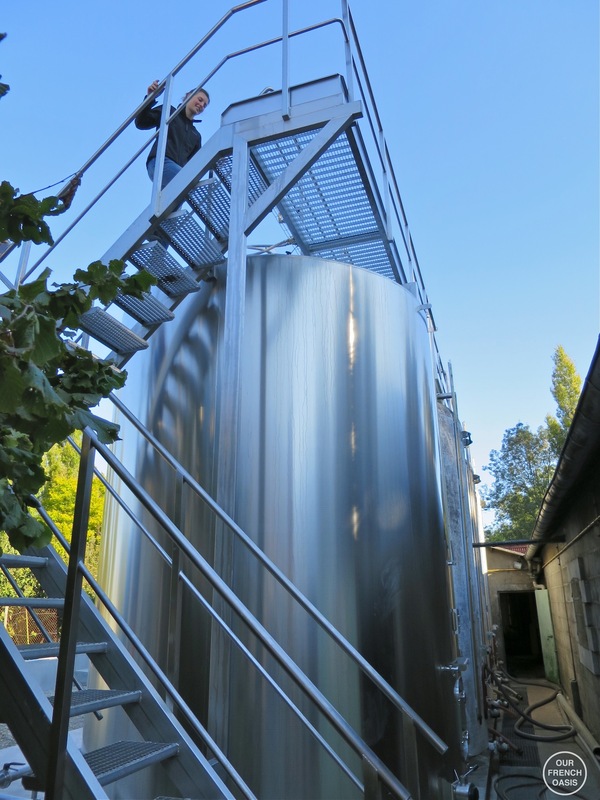 It goes something like this: as the grapes arrive, they are crushed and the juice is then left to ferment in huge storage containers for two to three weeks. As the liquid ferments, natural yeasts convert the sugar into alcohol and the juice reaches a typical alcohol content of about 10˚. 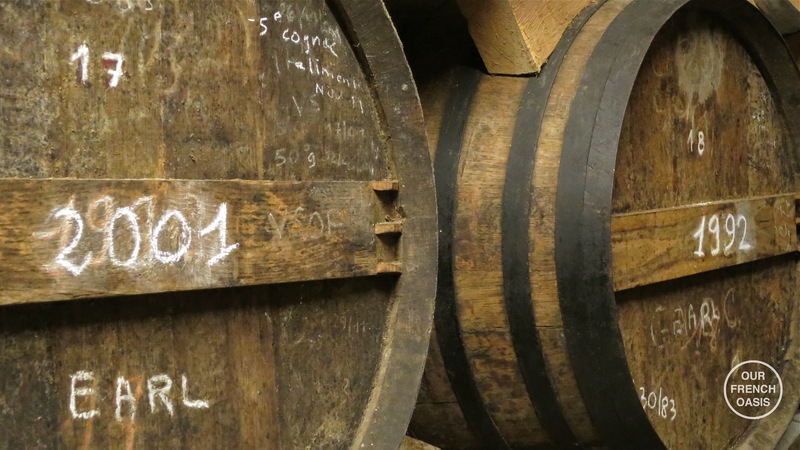 At this point the juice is then distilled, twice, and the resulting liquid is put into casks made from Limousin oak where it ages for several years, initially with a high alcoholic content of about 70˚. 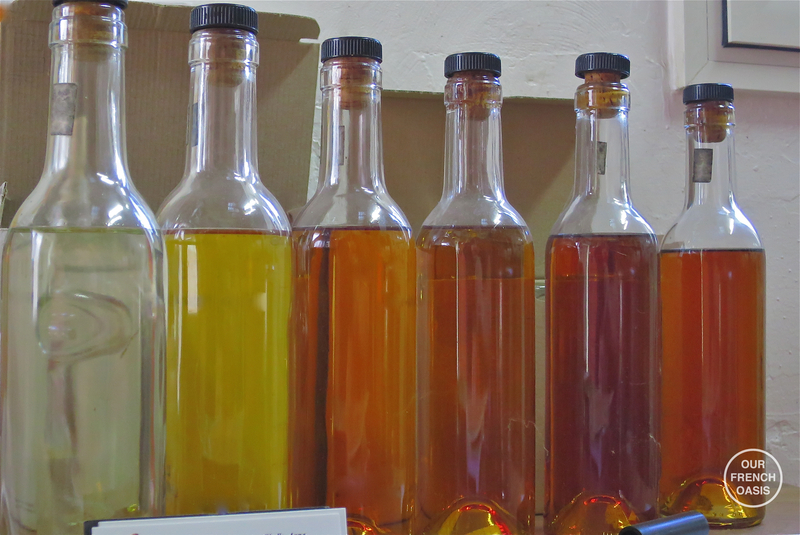 The eaux-de-vie at this stage is relatively colourless, and it must be aged for at least 2 years before it can be sold as cognac. As the cognac ages, it loses about 3% of its mass by evaporation, a deliberate interaction with the wood and air. The alcohol evaporates faster than the water obviously. Two notable bits of information Elodie let slip were that no sulphur is added to the product at any stage, and the distilling process has to be achieved over an open flame or else it is illegal! The final blending after several years of the various different ages of the eaux-de-vies into a finished cognac is undertaken by the master-blender, a process of which a portion is undertaken by Elodie, as she has been to Scotland and learnt blending skills there to go hand in hand with what she has learnt from her father in-house. It was at this point that Roddy and I started to look at Elodie in a very different light, as we realised we were talking to someone who would, in the fullness of time, be the 12th generation of family to distill and produce the cognac which quite obviously runs in her family’s veins. 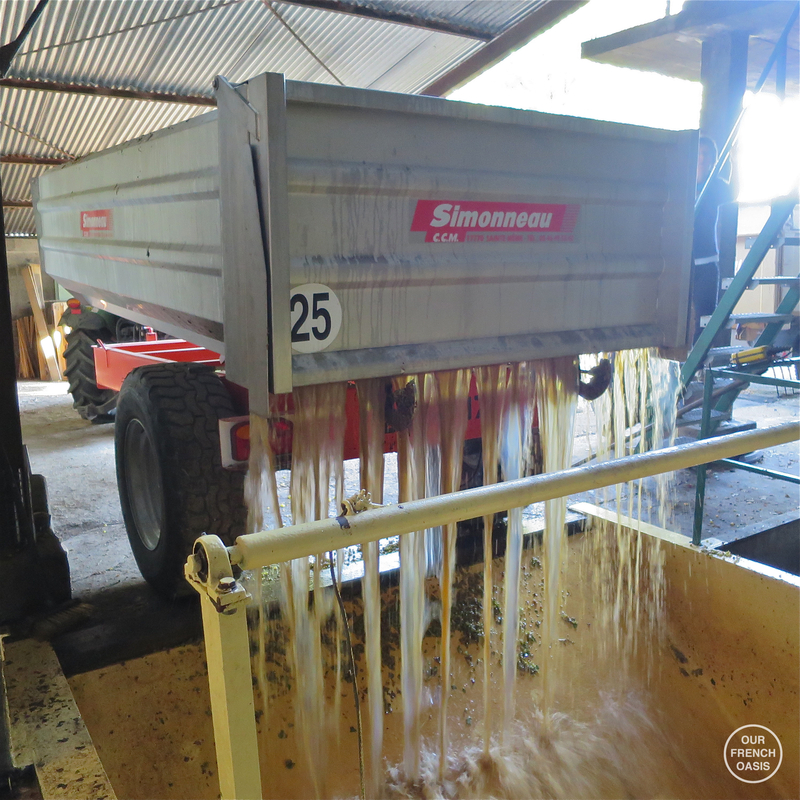 The domaine has 32 hectares of grapes, and when we left the chai and stepped outside to the storage containers for the pressed grape-juice, we realised that the amount of grapes those hectares produce means there is a LOT of liquid to be dealt with! 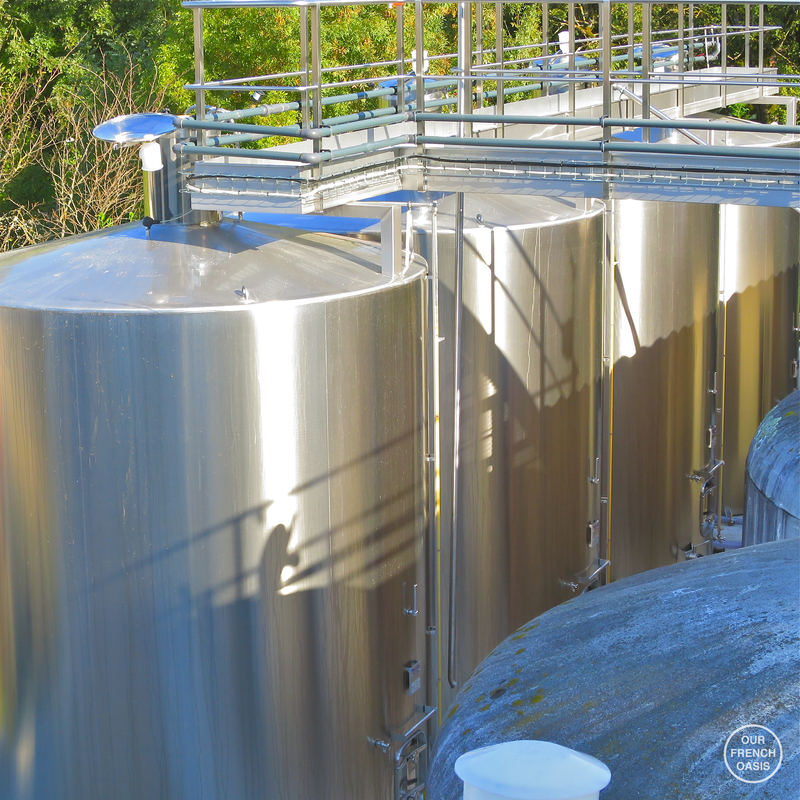 We were both quite shocked to be faced with what seemed to be a small refinery, and as we climbed the aluminium ladder to the catwalk above the huge stainless vats, we began to grasp the enormity of the industry before us. 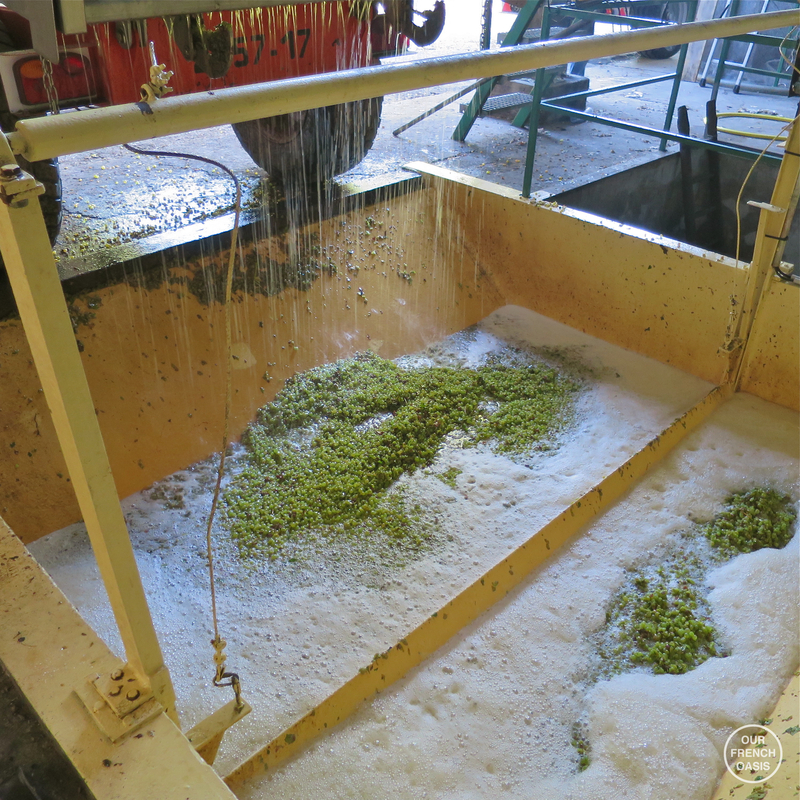 Below our feet, tractors rolled in with grapes to crush, and Elodie surreptitiously pushed buttons on panels, appraised thermometers and tapped sight-tubes as we talked. She mentioned how many litres of liquid each container contained, but I confess I ran out of zeros to add as we talked numbers. 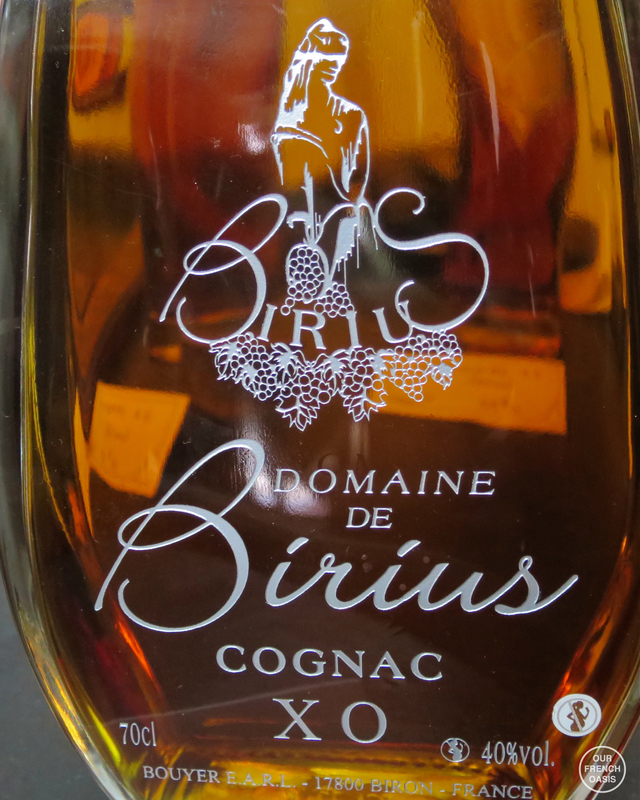 Almost all of the grapes grown at Domaine Birius are Ugni Blanc, one of a few varieties legally allowed to be used for cognac production. The juice from these fruits is thin, acidic and dry, and although the Domaine does produce Pineau des Charentes, some wine and some sparkling grape juice, their main product is solely eaux-de-vies and the final product – cognac. The tall vats wobbled in fermentation and lids lay open for escaping gas, and Elodie remarked casually that this is a very trying time for the producers, as too many things can go wrong, the worst of which is an unseen virus that causes an unusual rot, undetectable by anything but a laboratory test. 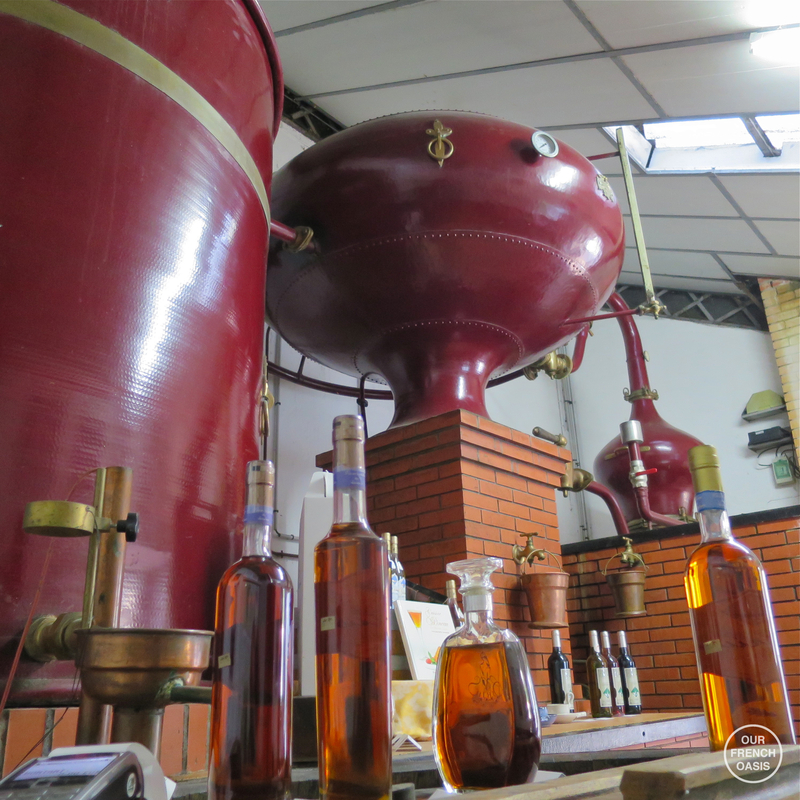 As it takes between 8 to 9 litres of pure grape juice to make a litre of cognac, even I could see that substantial quantities of wine are needed for cognac production. Descending the catwalk, Elodie ducked into a shed, and we watched as several trailer-loads of grapes were shuttled into position to be unloaded into the macerating process, each trailer unleashing a dirty sludge of fruity effluent that seemed very much at odds with the amber liquids we knew it produced. As we talked, Elodie was still busy tapping panels on walls, changing red lights into green, and green into red, all the while divulging information to us as she changed temperatures in vats containing thousands of litres of livelihood. It seemed so strange that someone so young and fresh should be so directly involved in the production of what is commonly thought of as a true adult’s drink. 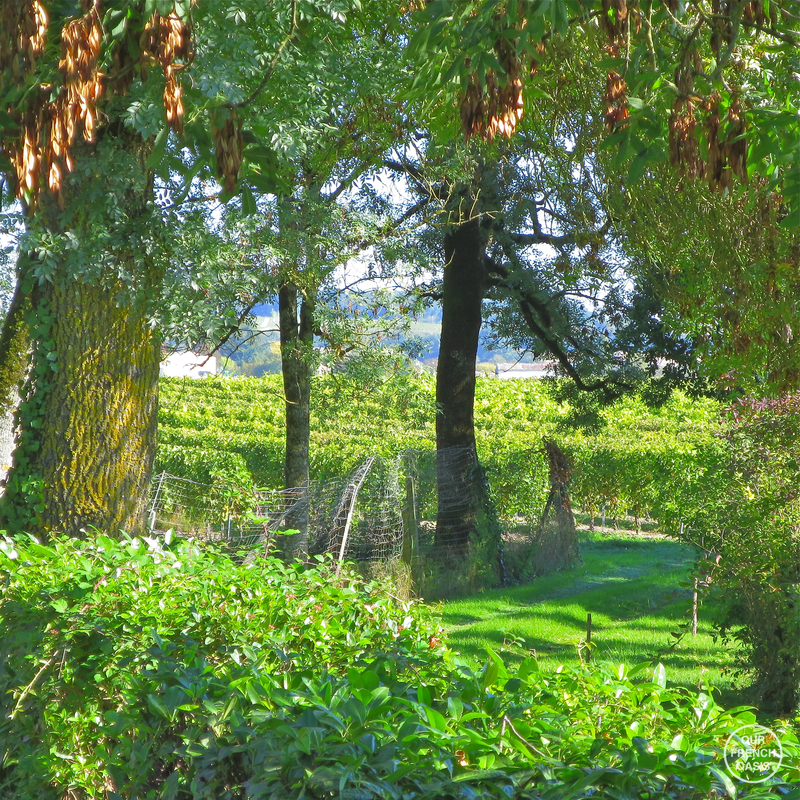 Of course in France, cognac is just another product of the countryside, to be enjoyed by all. From the pressing process, Elodie took us deep into the heart of the chai, where the effects of sun and frost cannot be felt, and led us into one of the cellars. Dominated by a succession of huge oak barrels, the smell of the ‘angels’ share’ was overpowering, heady and musty, but intoxicatingly exciting. The ‘angels’ share’ is the name given to the amount lost by evaporation during ageing, and as we gazed down the room at rank after rank of old and new oak barrels, we knew the angels must have a good time of it, for sure. Tucked away into a corner was some 1906 cognac, the Domaine’s legitimate oldest liquid, though Elodie did mutter there were other, unmarked consignments tucked away that could have been even older. 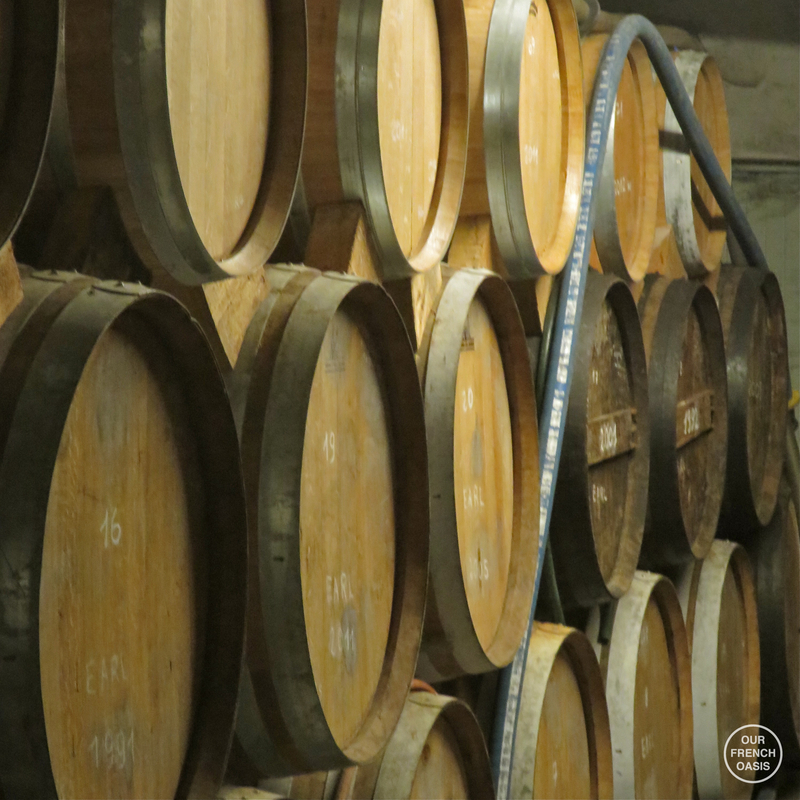 It is from these cellars and their barrels that Elodie and her father blend their final products; some of it fine cognac, and some of it going into the pinneau that the domaine is also very well known for. We walked down amongst the barrels, gaping at dates and other information, and I had to physically drag Roddy out the room, very aware that Elodie was very likely needed elsewhere in the domaine where we could hear machines clanking as others worked. Our last port of call was the distillery room again, where Elodie explained the blending process – a mystical time when years of experience and knowledge combine with the senses of taste and smell, a process that Elodie shares with her father as they seek to produce something very special from their distilled and aged eaux-des-vies. Finally, Elodie showed us the table where samples of the eaux-de-vies from different ages and barrels stood in serried ranks, and where she gracefully let us sample them as a part of understanding the great tradition of cognac. It was at this stage that we also finally fully understood how things worked – seeing the eaux-de-vies in this format, with different colours, and smelling the different bouquets, all combined to demonstrate how the finished product could be achieved. 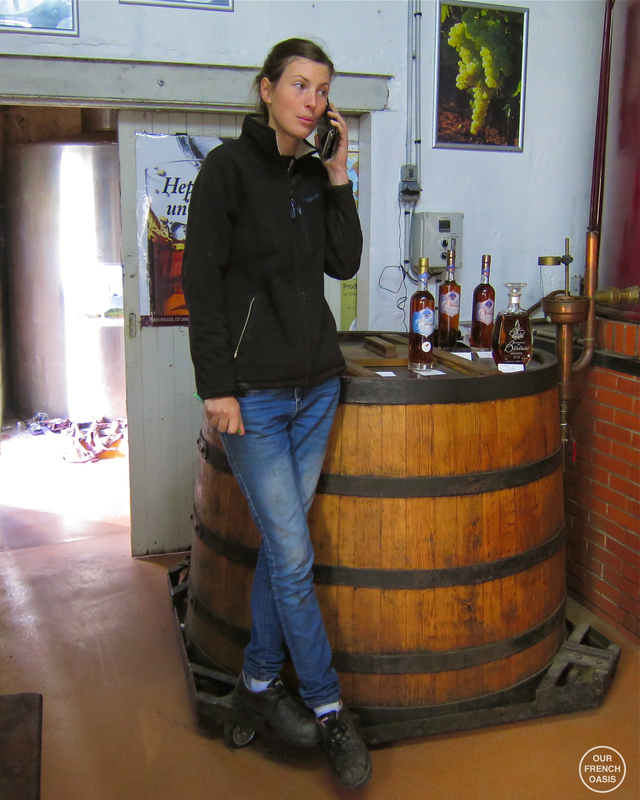 Elodie than gave us a small glass of several different cognacs to taste and we savoured the liquids to a notably higher degree than we would ever have done if we had not seen the small, personal touches that a family of true artisans could deliver to a small humble fruit and its juice. I had never felt more appreciative of a spirit perhaps than I did then. 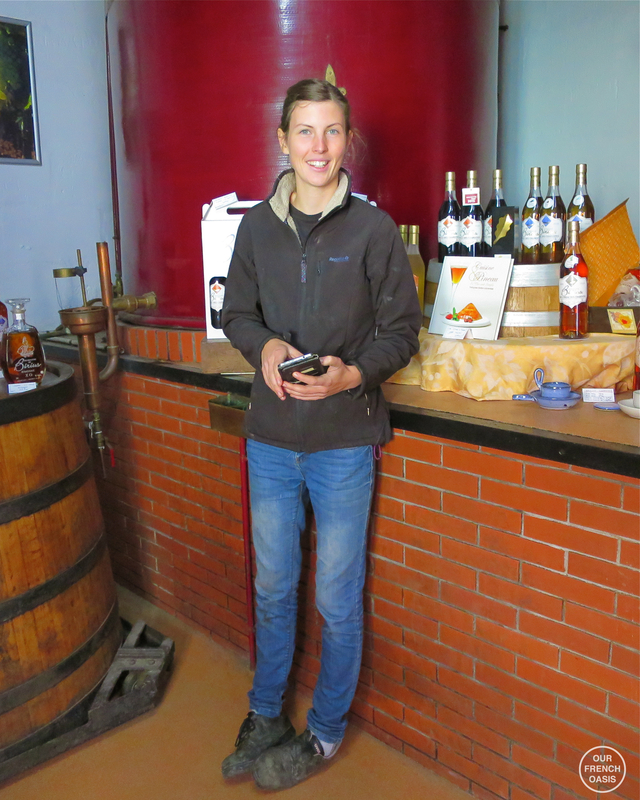 As we left Elodie to go back to her harvest of Ugni Blanc, we set off for home, clutching a bottle of VSOP we had bought. There had been no let-up in the work-rate outside; machines still scurried to and fro in the vines, but somehow as we now understood so much more it seemed so much more artisinal, more countryside than science-lab. So once again, in meeting and writing about local artisans, we had learnt a huge amount ourselves. Indeed, we marveled at the very ‘frenchness’ of the whole process, our cognac glowing in sunlight as it streamed through the windscreen of the car, while a faint waft of ‘angels share’ accompanied us all the way home. Oh my, I had no idea……. So wonderful to read your article. Merci. I could almost smell the angels share.